Well, it's not quite the Capital One, but it's better than the Gator. Either way it's a New Year's Day bowl in Florida against an SEC opponent. Who's that opponent? South Carolina. It's Hoke versus the old ball coach. I like it. It's a good opponent, and it will be a tough challenge for this Michigan squad. But of all the potential SEC matchups, I think S. Carolina is one of the more beatable, if there's such a thing. Plus, Tampa is one of the better bowl locations in Florida. Maybe Michigan, Nebraska and Northwestern can act as Big Ten ambassadors and swing by some southern schools on their way down/back to see if anyone's interested in Big Ten membership? ANN ARBOR, Mich. -- The University of Michigan football team earned a bid to play in the 27th annual Outback Bowl against No. 11 South Carolina on Tuesday, Jan. 1, 2013. The game will be televised nationally by ESPN starting at 1 p.m. from Raymond James Stadium in Tampa, Fla.
"The University of Michigan happily accepts the invitation to play in the Outback Bowl on New Year's Day," said Dave Brandon, the Donald R. Shepherd Director of Athletics. "We are honored to represent the Big Ten in Tampa. Our team worked very hard this season, and this is a reward for their effort. It's a great way to send out the seniors on Team 133." "We are excited to represent the Big Ten in the Outback Bowl," said head football coach Brady Hoke. "The Outback Bowl organization and those associated with the Tampa community run an outstanding bowl game. They made my final game as an assistant coach at Michigan a very enjoyable and memorable experience. South Carolina is an excellent football program and we look forward to the challenge of facing them on New Year's Day." Michigan (8-4, 6-2 Big Ten) finished the regular season in second place in the Legends Division. The Wolverines are ranked 19th in the Associated Press media poll and 22nd in the USA Today Coaches poll. Team 133's losses came to the No. 1, 2, 3 and 23 teams in the AP poll. Those four squads posted a 46-4 record during the season. South Carolina (10-2, 6-2 SEC) finished the regular season in third place in the SEC's Eastern Division. The Gamecocks are listed 10th in the USA Today Coaches poll and rank 11th in the AP poll. USC's only losses came in consecutive weeks, falling to LSU (24-21) and Florida (44-11). The Wolverines are 1-1 all-time against the Gamecocks, losing, 17-14, at home in 1980 and prevailing, 34-3, in Columbia during the 1985 season. "We are thrilled to extend an invitation to the University of Michigan to play in this year's Outback Bowl," said Outback Bowl Chairman Mike Kerrigan. "They are an exciting team featuring exceptional talent and should, along with our SEC selection, put on an exciting show on New Year's Day. We look forward to hosting the Wolverine team and their fans and ensure them it will be a fabulous experience." This will be Michigan's fifth appearance in the Outback Bowl. U-M has compiled a 3-1 record in the Outback/Hall of Fame Bowl, with appearances in the 1988, 1994, 1997 and 2003 games. The Wolverines defeated Alabama (28-24) in the 1988 game, North Carolina State (42-7) in the 1994 contest and Florida (38-30) in the 2003 game. The lone setback came against Alabama (17-14) in the 1997 game. • Michigan is making its 42nd all-time bowl appearance (20-21). • This will be the 32nd time that Michigan faces a Southeastern Conference school (23-7-1 record all-time). 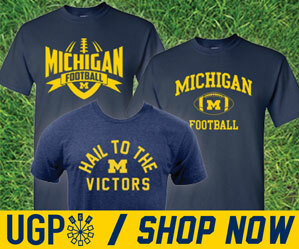 • The Wolverines have compiled a 7-4 mark against the SEC in bowl games. • Michigan has compiled an 8-5 bowl game record in the Sunshine State. • This will be the 36th all-time January bowl game for the Wolverines (18-17 record).